Back when Dave was in his mid-twenties, he weighed more than 300 pounds. No matter how closely he followed his doctor-prescribed regimen—1,800 calories per day, 90 minutes of daily exercise, working out six times a week—he just couldn’t shed the extra weight. His health was declining. His brain was foggy from the excess fat. His food cravings overpowered him and his energy plummeted. Exasperated by his lack of results, Dave took a different approach. He invested in testing, research, and interviews—more than $300,000 of his own money and 15 years of time—to find out what why his doctor’s advice wasn’t working for him. The result: Dave created the ability to “hack” his own biology—that is, to tweak his eating, sleeping, and exercising habits to finally get the results he was looking for—in this case, losing more than 100 pounds, upgrading his brain by more than 20 IQ points, reversing his biological age, and sleeping more efficiently in less time. One obsessive question drove his exhaustive investigation into hacking: What are the simplest things you can do to be better at everything? From that question, an idea emerged that revolutionized the way Dave lived his life: the quest to become “Bulletproof.” While it may sound grandiose, the concept is straightforward—implement evidence-based protocols, monitor your body’s response so you can take control of your health, and improve your biochemistry by making your mind and body work together. These hacks can allow you to perform at whole new levels of efficiency, while sidestepping burnout, sickness, and stress. That’s the theme behind Dave’s newest book, The Bulletproof Diet. One of the core secrets in this cutting-edge work is a slight tweak to the morning routine of millions of people: buttered coffee. Dave discovered that by blending high-quality, unsalted butter, MCT oil, and low-toxin coffee (non-cortisol raising decaf, of course), he was able to suppress his hunger, turn his body into a fat-burning machine, and boost his energy to stratospheric levels. The Bulletproof Diet isn’t just another run-of-the-mill fad (the butter coffee gave it away, right?) The amount of scientific evidence in Dave’s book is very impressive. Thanks to his extensive research, Dave looks at food and nutrition from his Bulletproof perspective and blows up nine of the most common weight-loss myths. I won’t divulge all of them, but here are four that may just pique your curiosity: DIET MYTH #1: If you’re not losing weight, you’re not trying hard enough. Anyone who has ever tried to lose weight has been haunted by this myth, either through self-talk or a well-intentioned health care professional. DIET MYTH #2: You’re not as hungry as you think you are. Forget about second-guessing the hunger signals your body is giving you. It’s all about hormones. DIET MYTH #3: A low-fat diet is healthy. Prepare to challenge your thinking about what’s an acceptable diet food (mmm…butter!) DIET MYTH #4: Eating fat will make you fat. 4,500 calories per day with 70% fat? Yes, please—and I’d like a smaller dress size, too. 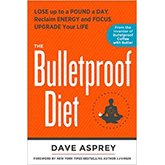 In The Bulletproof Diet, Dave Asprey has accomplished what few diet books do. Not only does he provide the scientific evidence for becoming Bulletproof, he gives it to us in a way we can understand and implement. If you’re ready to rock a new body, reach new heights of mental performance, and challenge what you think you know about eating and dieting, grab a copy of Dave Asprey’s The Bulletproof Diet and hack your way to better health.